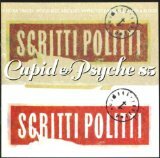 Cupid & Psyche 85 (this album) (1985). Scritti Politti: Wood Beez (Pray like Aretha Franklin) orig EX+ 7"
Showing latest 5 ratings for this track. | Show all 11 ratings for this track. Related links: top tracks by Scritti Polittitop tracks of the 1980s, top tracks of 1985.